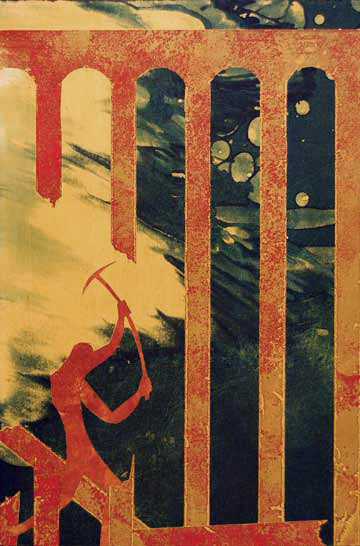 You are here: Home / All Posts / The Beauty of Struggle: The Art of Printmaker Charles Spitzack! 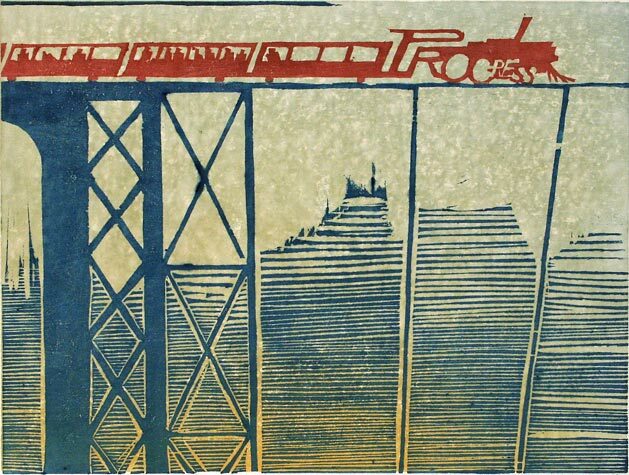 The Beauty of Struggle: The Art of Printmaker Charles Spitzack! “Workie Work” woodblock print by Charles Spitzack. All rights reserved. Artist Charles Spitzack is, quite honestly, an amazing guy. When I first met him, I wanted to hate him. 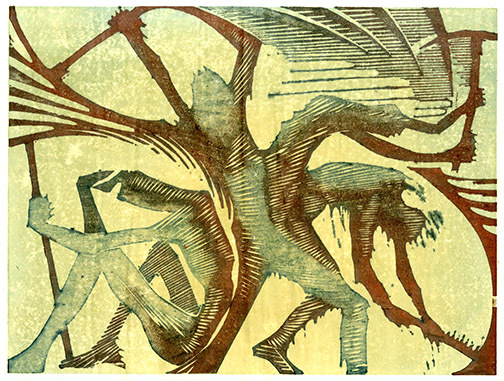 He’s only 24 years old, only been doing printmaking for 4 years…and yet he’s currently showing at Davidson Galleries, Seattle’s premier print gallery. A little bit of jealousy perhaps? No, not perhaps…absolutely. But the more time I spent with the young man with the Minnesota sensibilities and Seattle style, the more I liked him. But let’s back up shall we. 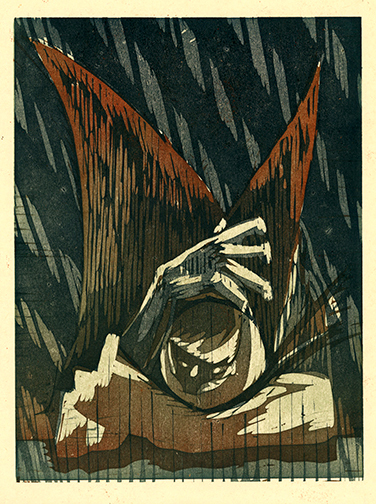 “Headless Figure” woodblock print by Charles Spitzack. All rights reserved. So, I walk into the annual Bemis Building Spring Art Show in Seattle. I’m there, primarily, to see Aaron Morgan‘s work at the exhibit. I walk in and the first thing I see are these beautiful prints (there was also some unbelievably, incredible watercolor works too…but that’s a later post!). As I walk down the line of prints, I find it harder and harder to continue on. Spitzack’s preferred color palette is extremely close to my own. It’s dominated by warm colors: reds, yellows, golds, greens and browns. Even the blues and blacks have a warm tone. “Bringing Together” monotype print by Charles Spitzack. All rights reserved. “Oh Boy…” woodblock print by Charles Spitzack. All rights reserved. Throughout Spitzack’s body of his work is imagery of humankind’s struggle: Men, backs bent, laboring away with pick axes. Distorted figures heavy with their own personal burdens. A train named ‘Progress’ careening down an unfinished track. 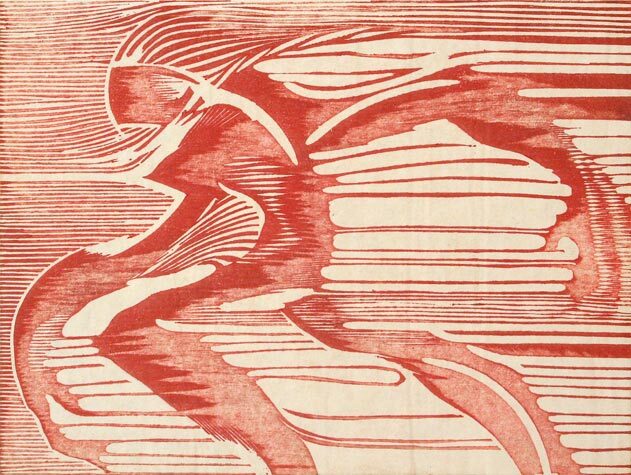 “Into the Wind” woodblock print by Charles Spitzack. All rights reserved. 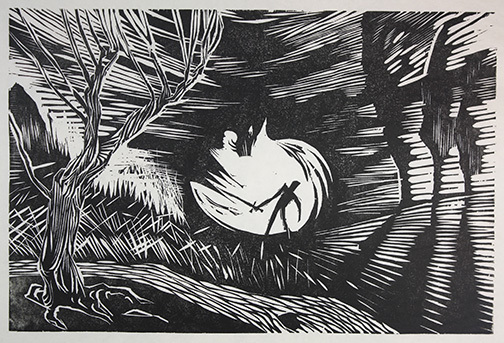 “Man vs. Nature” woodblock print by Charles Spitzack. All rights reserved. 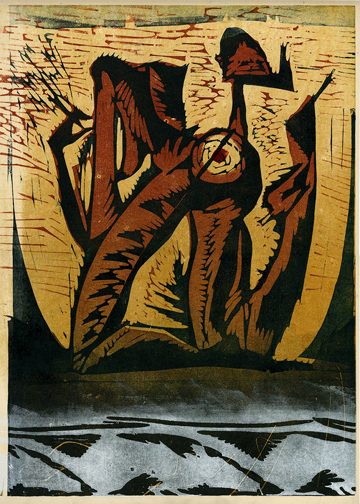 “Unsupported” woodblock print by Charles Spitzack. All rights reserved. This “hands-on” artist is also particularly gifted with wood. Hailing from a family that, until recently, ran a lumber yard and a father Spitzack calls “a builder” it’s no surprise he’s an accomplished art framer. Spitzack mats and frames all of his own work. It is this ability to create quality custom frames that set his work apart from others. The frames are thick, adding a solidity and certain kind of validity to his work. 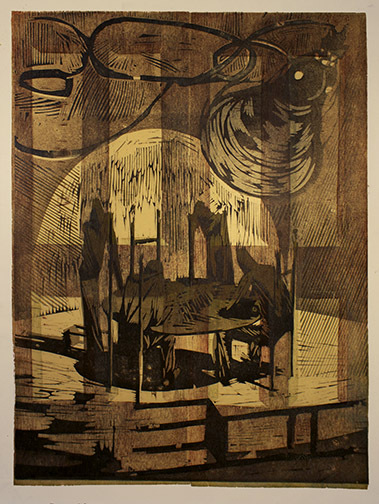 “Behind Closed Doors” woodblock print by Charles Spitzack. All rights reserved. 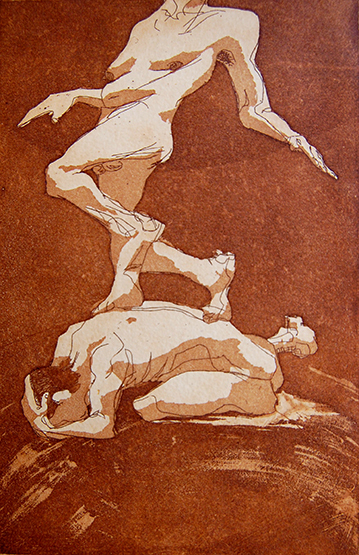 “Stepping Over” etching print by Charles Spitzack. All rights reserved. So Charlie, for making work that moves me and being such a cool cat, Give Us Art! salutes you! « ‘Extreme Math Metal’ Gods Meshuggah and Decapitated Punish Seattle!